A seminar class (Fall 2015) and exhibition (January 14- February 18, 2016) at Georgia State University, Atlanta, GA.
To get some answers we assigned our students a final research project to report on conditions here at GSU and at other Atlanta-area institutions which shape the prospects for meaningful creative work in the South. This collectively-produced document was edited together into a single volume titled Prospects for a Labor of Love. 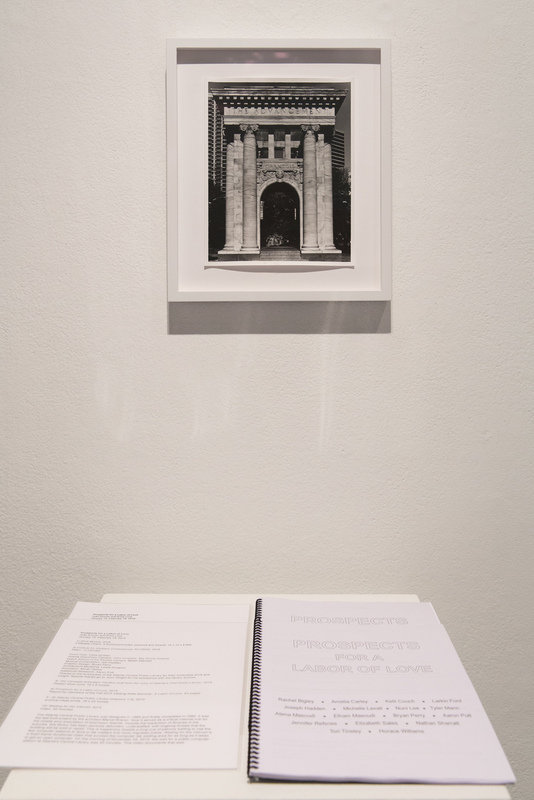 A pile of printed copies were on display at our exhibition at the university gallery which was also titled Prospects for a Labor of Love. A PDF of the document is also available for download. A committed art practice is a labor of love. Always an impractical preoccupation, an “art career” is nearly untenable as neoliberalism becomes the common sense of our time. What then are the prospects for art moving forward? On the one hand we have the largest unregulated market in the world and on the other is the internet, another market, which has distributed cultural production to a point where anyone can purportedly be an artist. Is knowledge production in the academy beholden to metrics established by these markets? If that’s the case then we will continue to argue for art from a defensive position by attempting to hold ground against inevitable losses down the road; be they from austerity budgets, creative industries hype, or the self-sabotage of gentrification and mounting student debt. Is a third way possible? One that takes a systemic approach to understanding technological change and the art market––not as simply givens––but as something to be acted upon and potentially instrumentalized to political ends. We could then work to answer how art can be valuable now. Through reconfigured institutions, art might activate the social imagination to address the most urgent contemporary problems––most notably inequality––all of which make Atlanta a suitable testing ground for these labors of love. On the morning of November 25, 2015, the wait for a public computer station at Atlanta's Central Library was 40 minutes. A video in Prospects for a Labor of Love documents that wait. The Central Library was the last built project by the Bauhaus-trained architect Marcel Breuer. Designed by Breuer and Associates in 1969, it finally opened its doors in 1980. The library embodied modernist notions that arrived late and ultimately never came to pass. Now it serves as a critical internet and education hub for the mostly poor African-American population of downtown Atlanta. Despite the expansion of libraries to the city suburbs, the Atlanta Central Library has been severely underfunded, understaffed, and continues to operate amidst threats that the building will be sold or razed. This is happening despite a consistent stream of patrons waiting to get on public internet computer stations and tend to critical life matters that have migrated online. For the exhibition we will deploy the Breuer library to frame the economic disparity that extends an existing digital divide: between those who lack internet access, and those who imagine technology as the key to prosperity and ultimate emancipation towards the pursuit of meaningful work (labors of love). A separate space in the exhibition is devoted to the Institute for Southern Contemporary Art (ISCA), a proposition for an art institution, to be housed in the Breuer library building, that leverages new technologies and the art market to support progressive art and political discourse. For ISCA’s first public program we have invited Our Literal Speed, represented by Christopher P. Heuer (Sterling and Francine Clark Art Institute, Williamstown, Massachusetts) and Matthew Jesse Jackson (Departments of Visual Arts and Art History, University of Chicago) for INTRODUCTORY LECTURE.